Sproule's third goal for County came against his former club but he was withdrawn late on in the match. "He has a problem with his hamstring but we're not ruling him out of Saturday yet as it doesn't look like it's a tear," said Adams. "When he pulled up I feared the worst as Ivan is a very quick player." 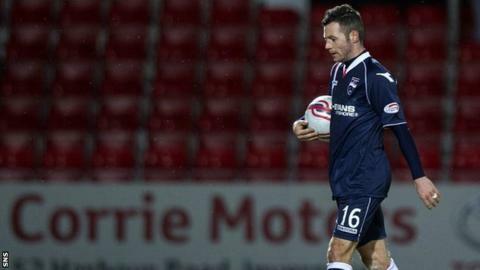 The solitary-goal win moved the Dingwall side 14 points clear of the relegation zone and to within four points of the top six. "It's been an excellent start to the year with 28 points now and Ivan Sproule has played a big part in that with three goals and an assist in the three games he has played," added Adams. "He was desperate to play against Hibs as he wanted to show them what they were missing and he certainly did that with a composed finish from a great through-ball from Iain Vigurs. "It's another good win for us - it's good to keep the momentum going. "We are six points off Hibs with two games in hand and four points behind Aberdeen, so we are doing well."